Nobody will ever confuse Mason Raymond with the hammer-fisted Tiger Williams. And he won’t likely challenge Daniel Sedin for the team goal-scoring crown any time soon either, but that won’t stop the Alberta boy from giving it a go. 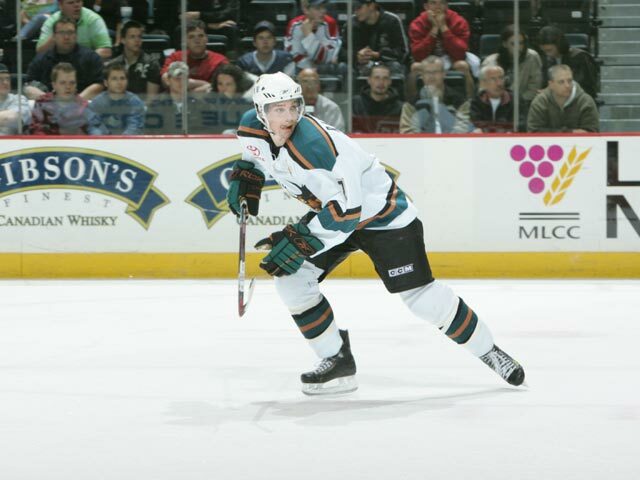 Drafted 51st overall in 2005, the former Camrose Kodiak knows it’s a tough haul to make a dent in any NHL team yearbook, let alone playing left-wing for a club that boasts a long tradition of talent at the position. Tiger and Daniel are just two. Then there’s Greg Adams, Geoff Courtnall, screamin’ Petri Skriko, and oh yeah, Markus Naslund. The ladder is a steep climb for Raymond. Then again, he wouldn’t want it any other way. At 21, Raymond is exactly what NHL teams are looking for: He’s greyhound fast - the dog not the bus - he passes the puck like a true Ornskoldsviker, and he’s got the heart of a Kodiak. In short, he’s exactly the type of player, and the kind of person, that a team dreams of coming away with after an entry draft. Raymond was a member of the University of Minnesota-Duluth Bulldogs this past season, and it’s an understatement to say that the 6’0, 182-pound speedster was a standout in his first two years with the team. 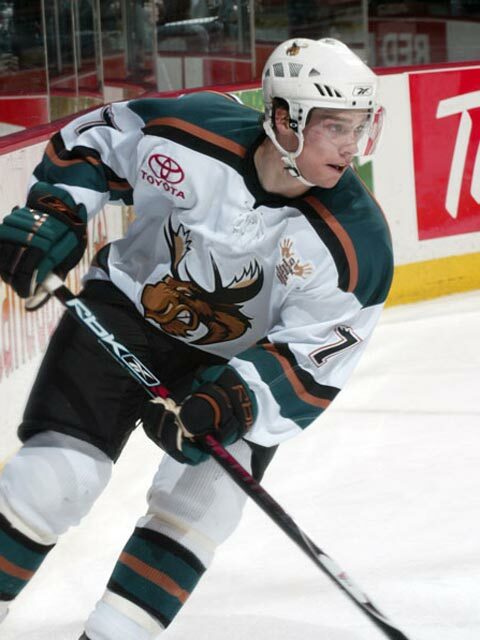 He was named to the Western Collegiate Hockey Association’s All-Rookie Team in 2005-2006, and in 2006-2007 he finished as the WCHA’s second-leading overall scorer with 46 points in 39 games behind only Jonathan Toews. Raymond was twice anointed WCHA Player of the Week, named to the All-Western Collegiate Hockey Association first team, and was awarded the Mike Seiler Award as UMD’s Most Valuable Player. But despite trophy case that’s starting to resemble the royal vault, Raymond opted out of his final two years of collegiate eligibility and left UMD in the spring to join the Manitoba Moose. Shortly after the Bulldogs lost to St. Cloud State in the first round of the WCHA playoffs this past March, Raymond signed an amateur try-out with the Manitoba Moose. 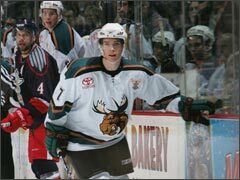 He played only two games with the Moose before the Canucks signed him to a pro contract, removing any doubt that he made the right move leaving UMD. 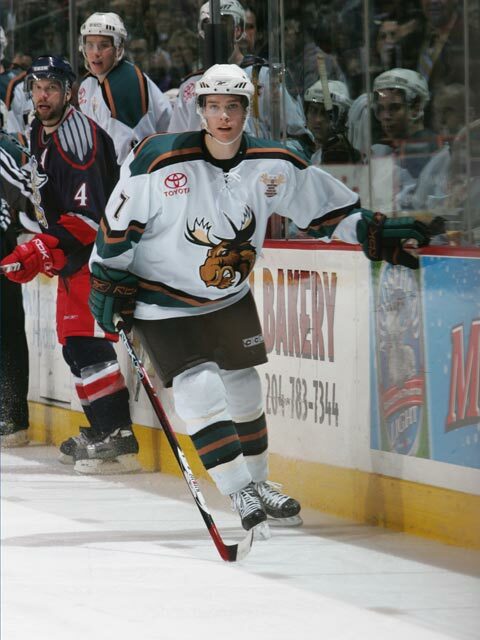 Raymond finished the 2006-2007 season with the Moose, accumulating four points in 11 regular season games. 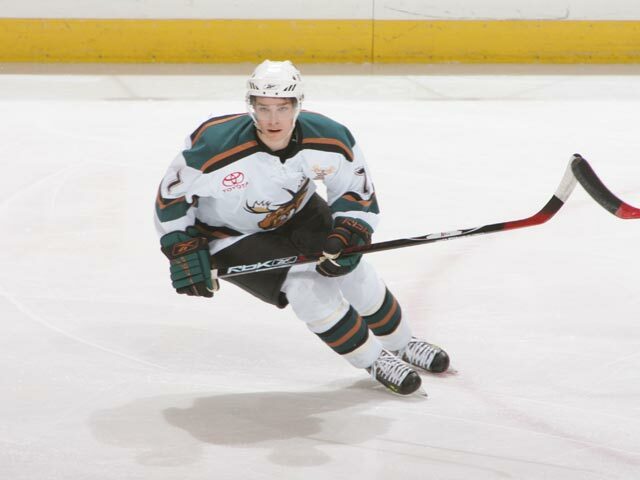 He played all 13 Calder Cup playoff games for Manitoba, and despite only recording one assist in playoff action, Raymond was pleased with how he closed out the year. Currently living on his family’s farm just outside Calgary, Raymond spends his mornings training, before returning home to help out with farm chores in the afternoon. He has been building muscle the old fashion way this summer, but don’t expect him to drop his stick for a pitchfork anytime soon as Raymond now has his sights set on a roster spot with the Canucks. Not that Vancouver fans need any more reason to believe that Raymond will be a major contributor to the team in the near future, but he personally feels that the recent changes that have taken place in the NHL will aid his style of game. The hockey world first took notice of Raymond while he was a member of the Camrose Kodiaks of the Alberta Junior Hockey League. He racked up 144 points in 112 games in two seasons from 2003-2005, leading the Kodiaks to back-to-back Dave Duchak Trophies for regular season champions. 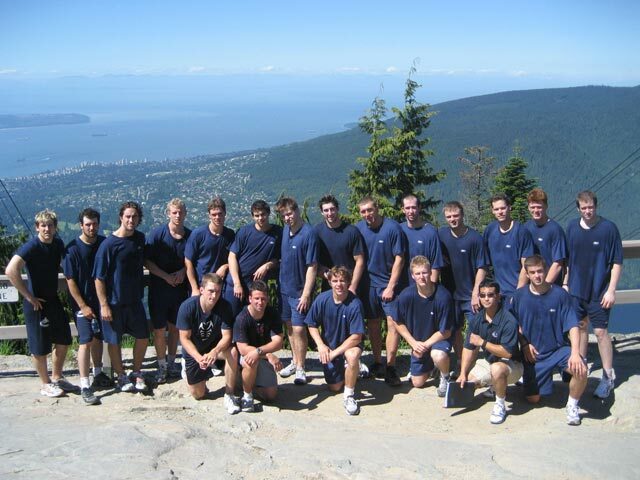 The team also captured consecutive South Division championships, and in 2004-05, Raymond scored a league high 41 goals, and was fifth in league scoring, while helping Camrose win the Doyle Cup. Awarded the Alberta Old Time Hockey Players’ Trophy as league MVP, Raymond has been steadily improving each aspect of his game ever since. Scouting reports on Raymond continue to provide mixed reviews, some question how well he shoots the puck, while others say he needs to develop more strength, but there is no questioning Raymond’s overall skill. There’s no questioning the fact that it won’t be long before Raymond dawns a Canucks jersey either.